On January 26, 2017 Saturn moved into Sagittarius and stayed there until June 21, 2017 when the retrograde move back into Scorpio until October 26, 2017 occurred. Saturn will return to Sagittarius on 19 December 2017 and remain until movement into the next sign of Capricorn in 2020. We live in challenging times, with conjunction of Saturn-Mars, Mars having lordship of all planets until 22 May, and then transit with Sun aspecting Saturn – Mars when Sun moves to Taurus. Sun then will cause much trouble for leadership people, opposition to leaders, and causing downfall. We offer one puja for world peace, for all: loka sevanam, for all beings in all the worlds. This puja for world peace will take place in Kumbakonam on 30-31 May 2016, and offerings to Pratyangira Devi on second day. All are welcome to participate. Shadow planets Rahu and Ketu are ever retrograde in their motion. Forever chasing Sun and Moon in order that they might avenge their beheading by Sun and Moon after the Churning of the Ocean. With such action, they cause the eclipse of Sun and Moon. Where eclipses happen, the nakshatra is spoiled for the next six months. As shadow planets, they move through the birth chart transit signs with eternal backwards moving motion and every 18 months, change signs and the all-important Rahu-Ketu axis – which has significance for nations and their leadership in particular changes. All is change in the body of time and space. They also elicit, by their transit and retrograde motion, changes within the human person. Rahu and Ketu affect all with their transits. During January of 2016, Lord Rahu Bhagavan and Lord Ketu Bhagavan will change signs (peyarchi). On Monday, 6 July at 01:03AM IST, Planet Jupiter – Brihaspati Deva will complete its year-long occupation of Cancer-Kartaka and transit to Leo-Simha rasi. This transit will cancel the auspicious aspect – trikona – between Jupiter and Saturn and Ketu – and due the transit occurring in the nakshatra of Magha (ruled by Ketu) will deliver very auspicious results for spiritual endeavour. On this auspicious occasion Archana, Homam, Abhishekam, along with Sankalpam and Pujas will be performed to Lord Ganesha and to Guru Dakshina Murthi at the Suriynaar Temple, at Suriyanar Kovil, near Kumbakonam, Tamil Nadu, on 12 July 2015. In mid-May, the Sun will transit from Aries to Taurus, where it will join Mars and Mercury, and will aspect Saturn by 7th sight. As Saturn and Sun are mutual enemies, and first class malefics, this transit will have mundane effects for those in leadership positions, as Sun takes its supreme position for granted in Taurus. This is indicating fall from power for those in high office, particularly those who take their office and wealth for granted. From the 16th December, 2014, the planet Saturn will transit from the sign of Libra into Scorpio. Scorpio is not at all a favourable sign for Saturn to occupy. As of late July 2014, Saturn is in Tula (Libra) where it is in exaltation. Saturn will then move from Libra to Scorpio, where Mars is the sign lord. Mars is neutral to Saturn, Saturn is enemy towards Mars. 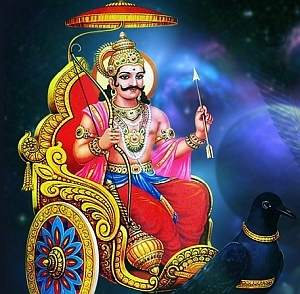 Lord Shani Dev – Saturn is going to stay in its opponents house for the next 2 1/2 Years. Hence the incoming year 2015 is going to make dramatic changes into the life of everyone by bringing unexpected surprises. From the 13 October, 2014, planet Mars will turn sandhi and will transit from the sign of Scorpio into Sagittarius. There will be world wide affects, due aspect of Saturn to Mars in Sagittarius. 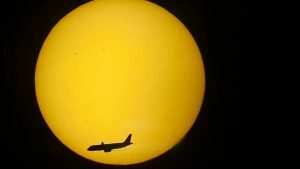 Agastya Nadi astrologer Sai Bharathi advises the impact of this transit below. From the 16th December, 2014, at 2:17pm the planet Saturn will transit from the sign of Libra into Scorpio. There will be world wide affects, particularly in the South East and South West directions. Agastya Nadi astrologer Sai Bharathi advises the impact of this transit below. 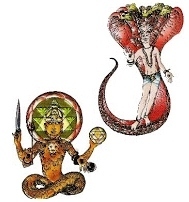 Shadow planets Rahu and Ketu are ever retrograde in their motion. Forever chasing Sun and Moon in order that they might avenge their separation by Sun and Moon after the Churning of the Ocean. With such action, they cause the eclipse of Sun and Moon. As planets, they move through the birth chart and gochara (transit) in backwards – retrograde – moving motion and every 18 months, change signs and their all – important Rahu-Ketu Axis, which has significance for nations and their leadership in particular. They also elicit, by their transit and retrograde motion, changes within the human person. Rahu and Ketu affect all with their transits. During June of 2014, Lord Rahu Bhagavan and Lord Ketu Bhagavan will change signs (peyarchi).